Video tag user to Apple: Get your act together. Don’t say that you support a feature when you really don’t. Apple’s implementation lacks support for the controls attribute, which tells the browser to display a native interface for video playback. I don’t really have a problem with this, but why the heck does Safari tell me that it does support it? The controls attribute is treated as if it was supported with the controls property mirroring the value of the controls attribute. So myVideoElement.controls is true or false instead of the undefined I’d expect for an unknown attribute. Don’t say that you support h.264 when you really only support is your own special flavour. There’s a lot discussion going on over which codec to use for video, but something that’s often overlooked is that Apple’s h.264 decoder is a proprietary mess that will only accept Quicktime created MP4s. Since video in Safari uses the Quicktime backend that means that you won’t be able to actually use h.264 unless you fork some cash over to Apple for Quicktime Pro, even when there are many better and cheaper alternatives. This is exactly the lock-in that shouldn’t happen with video. The only real alternative for now is using the MPEG-4 Advanced Simple Profile (better known as DivX or XviD) and suddenly all the better quality you were promised in exchange for having to use a proprietary format is gone. Posted on June 24, 2009 July 11, 2010 Leave a comment on Video tag user to Apple: Get your act together. As you may have noted, the formatting on my older posts has been lost, because Blogger wouldn’t let me edit my HTML without adding additional linebreaks unless I disabled them in both HTML and Compose view, which also effected existing posts (which I didn’t notice until it was too late). I’ll try to rebuild the posts ASAP. Apparently, your browser is unable to play open web video. Currently, compatible browsers include Firefox and Chrome. function much like a traditional bitmap, only these bitmaps have 3 dimensions, much like a video (where the third dimension is time). Today you find them mostly in medical scanners. angle, it works well enough. want to know how the perspective rendering is done you should look there. channel is entirely opaque/very bright, while the bottom ones pretty much ignore the alpha channel. , and that’s with a 768×512 surface. It’s not very difficult to understand, but there’s simply a lot of processing needed and the speed at which Firefox renders this is nothing short of amazing. Click to get to the SVG. When font-face made it’s appearance in all major browsers I was really, really excited. Until I learned that I wouldn’t be able to use any commercial fonts and even most free fonts. So I’ve started working on my own. It’s terribly basic and isn’t even complete yet, but I thought that maybe some people could even have use for an incomplete font. It is currently available as an SVG containing the letters A-Z, a-z and the numbers 0-9.
schmucker-sans-nothrills-rev0 is built from first principles: Lay out a grid for your letters, create one arc for the round parts and try to assemble all letters from these parts. It’s not exciting, but it should be easily readable so you can also use it for longer text paragraphs, not just headlines. The most interesting thing is probably the license, which allows for pretty much anything. I’m putting this into the public domain. So, create fonts or use it in your logos or basically do whatever you like. Would be nice if you sent me a mail though. It’s probably best to let you play with this little demo first. The animation is stored only once and the texture is applied dynamically. Keep in mind that this is only a techdemo. Somebody more familiar with animation could use this technique for something truely great (think along the lines of you uploading an image of yourself and suddenly you’re appearing in a movie, thanks to the combined power of the video tag and this). The technology is not the limiting factor here, just my artistic skills. .. .is actually pretty simple. 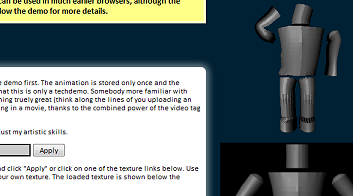 An animation is rendered with a placeholder, instead of a real texture. This placeholder contains the position in the texture (encoded as color). Specifically, the model was rendered with this texture, using a planar projection for UV coordinates. 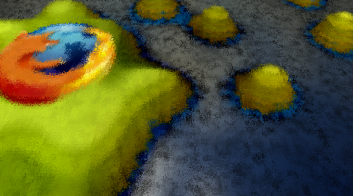 When the animation is shown, the pixels get replaced again with pixels from some texture that the user or the developer specifies. All this can be done with SVG filters, specifically feDisplacementMap. If you want to know in detail how it’s done, have a look here. The only real difference here is that instead of a static map, a series of images is composed into an animation. You may also want to look at the source of the demo. Everything needed to recreate the effect shown here is marked with the keyword IMPORTANT. Can only Firefox 3.5 do this? And why aren’t you using the video tag? Most modern browsers can do this, but there are a few differences that you should be aware of: To make this work, your video has to be stored in a lossless format. For Gecko based browsers that’s usually APNG in an IMG or maybe at a later time Theora (the current encoders don’t allow for for lossless YUV compression, but that’s likely a limitation of the current tools, not the format, as we’ve seen with JPEG or h.264) via VIDEO.  For Webkit it’s lossless h.264 and for legacy browsers it may be a greyscale GIF containing the color channels side by side, so they can be recombined by the filter. Older browsers also need the filter applied inside an SVG document, so you’ll have to load an SVG in an iframe to do the rendering. To sum it up: This demo only works in Firefox 3.5 because I didn’t want to spend more time optimizing it. I wanted to show you what can be done and Firefox 3.5 made it easiest for me. But you can make it work. For a few pointers, see this file, which implements a similar solution in pure SVG. Sometimes working on a production website reminds you of problems you thought that were long gone. In this case, I needed smooth image scaling for the majority of browsers and yes, that sadly still includes MSIE6 and Firefox2. That’s pretty much it. Now I’m off to investigate Safari and Opera. I just had to play with SVG filters a little more.